Georgous girly look. Love your style you beautiful lady: )))???????????? I love chic girly looks like this! Pink is one of my favorite colors and of course leopard is always a staple print. A top knot is ALWAYS chic and your bag is so cute and vibrant! You ALWAYS look so good in your clothes, (the fit & style). As hard as I try I never look pulled together. Grrrrr! I am obsessed with that MK bag!!!! OMG!!! I am OBSESSED, I mean obsessed would be an understatement!! I need this exact outfit from head to toe lol. OMG I am obsessed with that bag. Gorgeous!! Amazing pics today. Love the one where you are walking towards the street. Oh my… this look just SCREAMS… sophisticated! 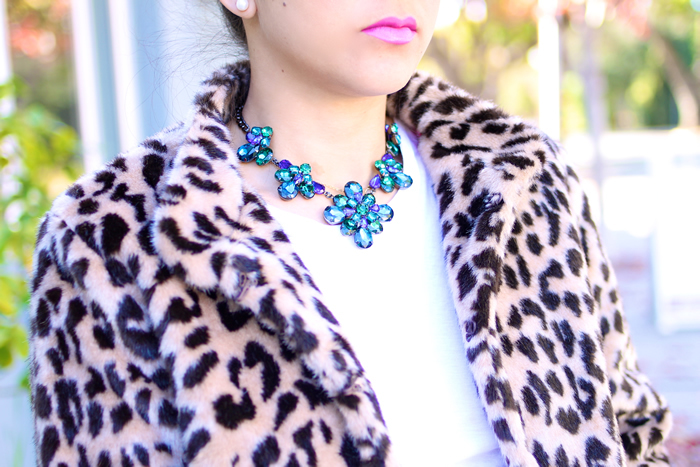 Love the leopard and the pink cour combo! Very girly and chic!